Graham Phillips discovers a coded message left by the Knight Templar and goes in search of the Ark of the Covenant and the tablets of the Ten Commandments. 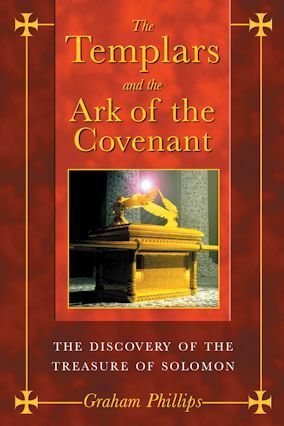 According to the Bible, the Ark of the Covenant was a miraculous golden chest that contained two sacred stone tablets inscribed with the Ten Commandments. If it existed as it is portrayed in the Bible, the Ark of the Covenant has to be one of the most extraordinary artifacts in history. It could raise storms, radiate divine fire, level city walls, smash chariots and destroy entire armies. Moreover, it could summon angels and even manifest the voice and presence of God. The Ark of the Covenant was kept in Solomon’s Temple in Jerusalem until it disappeared from history following the Babylonian invasion of the city in 597 BC. Biblical scholars, archaeologists and adventurers alike have spent years searching for the last resting place of the Ark, but until now its secret hiding place has remained one of history’s most enduring mysteries. English edition: Bear & Company 2004. Translations: Newton & Compton (Italian), Editorial Planeta (Spanish), Madras Editora (Portuguese), Nokta Kitap (Turkish), Eurasia Publishers (Russian), Hermes Publishing House (Bulgarian), Metaekdotiki S.A (Greek), Metaekdotiki S.A (Czech), Remedium Publishing spol.s.r.o (Slovak). In The Templars and the Ark of the Covenant, Graham discovers evidence that this remarkable relic really existed and was discovered by the crusader knights, the Templars, during the Middle Ages and brought back to Europe. From the war-torn Middle East to the quiet British countryside, Graham follows an ancient trail of clues in search of the mysterious lost Ark.